Director: Jeff Burton / Writers: Burton, Erik F. Hill & Bill Vincent / Cast: Anita La Selva, Jason Carter, Bill Vincent, Spice Williams-Crosby, Jennifer Lantz, Gunhild Giil, Erik F. Hill, Curtis Hall, Casimir Borowicz, Bonner C. Upshaw III, Robert Leeshock, Dee Wallace Stone, Dennis Haskins. There’s something appealing about the concept of ‘The Edgar Allan Poe Killer’, a serial murderer who bases his slayings around the tales of the master of the macabre – how could it go wrong? Answer: budget. Starting well with a murder that puts a great spin on The Tell-Tale Heart, detective Burt Williams has been trying to catch the fiend for three years and is eventually struck off the case by his FBI daughter (!) who is close to tricking the killer into meeting her by posing as another IQ-challenged internet victim. Meanwhile, a quintet of dope-smoking, “law enforcement students” of her cop-turned-lecturer father decide to take a trip out to the hoise where the killer, his identity known but notoriously elusive, used to live and, by contrived change, has just taken FBI daughter-girl hostage! 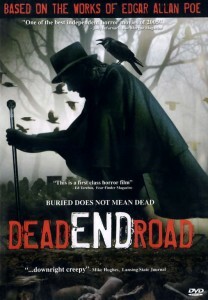 The road where the house is located is a dead end, in case you were wondering what the hell the title was about. While FBI daughter-girl awaits her fate beneath a giant pendulum, our Poe-wannabe stalks and slaughters the “law enforcement students” before a showdown with the father-daughter cop team. There are some fun murders, like a sword through the head, pitchfork in the face and a decapitated head being spewed out of the bowling ball return conveyor thingy, all set to the killer’s quotes of Poe’s most famous works, “never more” being the appropriate follow up to one brutal kill. Sadly, the whole project is undermined by the amateur-night performances (Stone and Haskins briefly cameo) and camcorder-esque photography. Still, at a mere eighty minutes, it doesn’t outstay its welcome by much. Blurbs-of-interest: Dee Wallace Stone is also in Popcorn, Scar (the ‘less good’ one) and Rob Zombie’s Halloween retooling; Spice Williams-Crosby was in Fatal Games under her previous name Marcelyn Ann Williams.